He gained the title of Count de Chambrun. 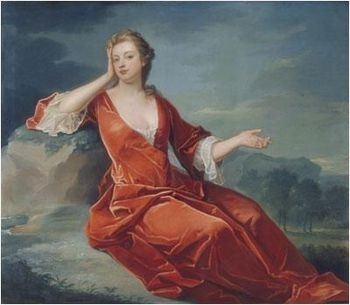 Sarah Jenyns was born on 5 June 1660 at Holywell, Hertfordshire, EnglandG.3 She was the daughter of Richard Jenyns and Frances Thornhurst.4,5 She was baptised on 17 June 1660 at St. Albans Abbey, St. Albans, Hertfordshire, EnglandG.3 She married John Churchill, 1st Duke of Marlborough, son of Sir Winston Churchill and Elizabeth Drake, on 1 October 1678.6 She died on 18 October 1744 at age 84 at Marlborough House, London, EnglandG, leaving a fortune of £3,000,000.3 She was buried at Chapel, Blenheim Palace, Woodstock, Oxfordshire, EnglandG.7 Her will (dated 11 to 15 Aug 1744) was proven (by probate) in 1744, bequeathing to her first woman, Mrs. Grace Ridley, two portraits of the Duke and one of herself, to the Duchess of Leeds a watercolour portrait of the Duke, and to the Duchess of Montagu a snuff box with two portraits of the Duke and another covered with a large diamond. She left £500 apiece to a Mr. Richard Glover and Mr. David Mallet, to write an account of the Duke's life from his available papers—which was never written. [S6] G.E. Cokayne; with Vicary Gibbs, H.A. Doubleday, Geoffrey H. White, Duncan Warrand and Lord Howard de Walden, editors, The Complete Peerage of England, Scotland, Ireland, Great Britain and the United Kingdom, Extant, Extinct or Dormant, new ed., 13 volumes in 14 (1910-1959; reprint in 6 volumes, Gloucester, U.K.: Alan Sutton Publishing, 2000), volume VIII, page 496. Hereinafter cited as The Complete Peerage. [S6] Cokayne, and others, The Complete Peerage, volume VIII, page 495. [S10] John Pearson, Blood Royal: The Story of the Spencers and the Royals (London, U.K.: HarperCollins, 1999), pages 49-58. Hereinafter cited as Blood Royal. [S18] Matthew H.C.G., editor, Dictionary of National Biography on CD-ROM (Oxford, U.K.: Oxford University Press, 1995), Churchill, Sarah. Hereinafter cited as Dictionary of National Biography.